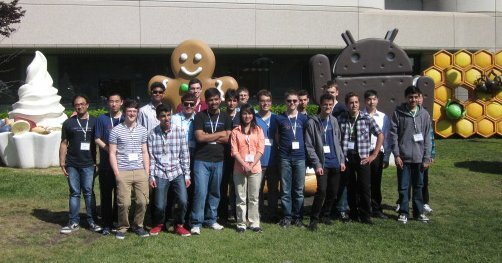 In late April, the Google Open Source Programs Office hosted the 20 grand prize winners of the Google Code-in (GCI) 2012 contest. From November 2012 - January 2013, 334 students from 36 countries completed coding, documentation, user interface, quality assurance, research, outreach and training tasks for ten open source organizations. At the conclusion of the contest, the 10 open source organizations each chose two students as their grand prize winners based on the student’s comprehensive body of work. The 20 grand prize winners received a five day trip for themselves and a parent to Google’s headquarters in Mountain View, California. These students traveled from 12 countries (Argentina, Australia, Bulgaria, Canada, China, India, Ireland, Poland, Romania, Ukraine, Uruguay and the midwestern and eastern USA) to enjoy some northern California hospitality. The first event of the trip, a meet and greet party at our hotel near Google’s campus, was designed to break the ice and get the students talking to one another and to shake off a bit of their jet lag. With two students from each of the organizations the students had already virtually ‘met’ at least one other student before they arrived in California. Students immediately started sitting around the tables and introducing themselves while enjoying a variety of appetizers. We handed out the first batch of swag items and enjoyed an ice cream cake before heading off to catch some sleep before a full day at the Googleplex. The morning started with a short introduction about the Google Code-in program (for the parents) and the distribution of some Google Code-in attire for the students. Students were excited to get started with the day to hear from a variety of Google engineers and to have the opportunity to ask them questions. Next, Chris DiBona, Director of Open Source Programs at Google, talked about the history of open source at Google and how the GCI program started. Chris then led the award ceremony where he distributed plaques to the winners and posed for pictures with the students. We had two students who were Grand Prize Winners in previous Google Code-in programs who were back for their second trip to the Googleplex. Chris wrapped up by answering questions the group had about Google in general. Students were then treated to an interactive tutorial by Jeremy Allison on how to design a file server. Justin Mattson gave a talk about life as an engineer at Google and what it is like working on the Android team. We then broke for lunch at the nearest Google cafe where Googlers from many of the student’s home countries sat with the students to chat with them over lunch. After lunch students were treated to a short video and a talk by Dmitri Dolgov about Google’s self-driving cars, complete with a trip to the parking lot where the group could see a self driving car in person, posing for some pretty cool pictures. Next up, Nathaniel Manista talked to the students about physical spaces that foster creativity and life as an engineer. Then Mark Diaz discussed Google life and working as a Field Tech at Google. Shawn Pearce wrapped up the afternoon with a chat about Git and Gerrit Code Review. And next, one of the activities students had been waiting all day for — a tour of the Googleplex. The tour isn’t complete without a stop at the awesome Android statues depicting all of the Android releases, where the students and parents posed for a slew of pictures. After a walk in the fresh spring air around the main campus at Google, the students settled in for Grant Grundler’s talk about Chromium. Sudhakar Chandra chatted about the internationalization (i18n) efforts at Google, a perfect fit with this group speaking so many different languages. The final talks of the day were from Google Open Source Programs team members, Carol Smith and Mary Radomile. Carol talked about the Google Summer of Code program, our program for university students (18 years and older) where students spend an entire summer writing code for an open source project. The program is a natural next step for these students and, in fact, we have one Google Code-in Grand Prize winner who was recently accepted as a student for Google Summer of Code 2013. Mary Radomile wrapped up the talks at Google with answers to some general internship questions that students had been inquiring about. 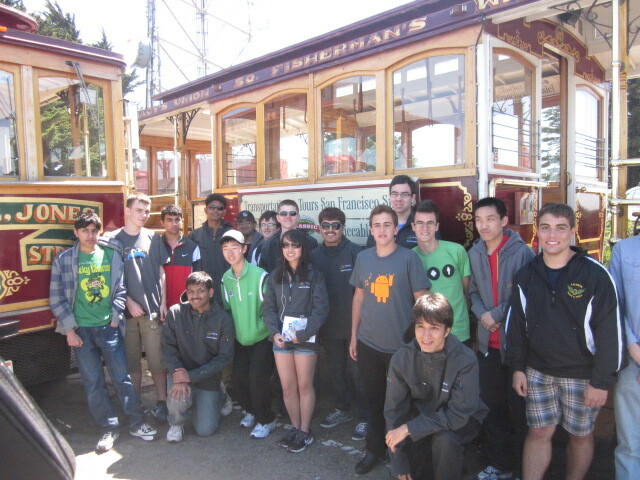 Students went shopping at the onsite Google store then after a hearty dinner at Google everyone boarded the bus to San Francisco to get a good night’s sleep before a very full day 3. The busiest day of our trip started off early with a third of the group boarding the ferry to Alcatraz for a self guided tour of the historic San Francisco prison and the other two thirds of the group heading off on segway tours of the Fisherman’s Wharf and North Beach neighborhoods of San Francisco. After our morning adventures the group met up for a picnic lunch in Aquatic Park by Ghirardelli Square where we then boarded 2 motorized cable cars (we couldn’t all fit on one) for a tour of all of the highlights of San Francisco, including stops atop Nob Hill, Civic Center, and Twin Peaks. 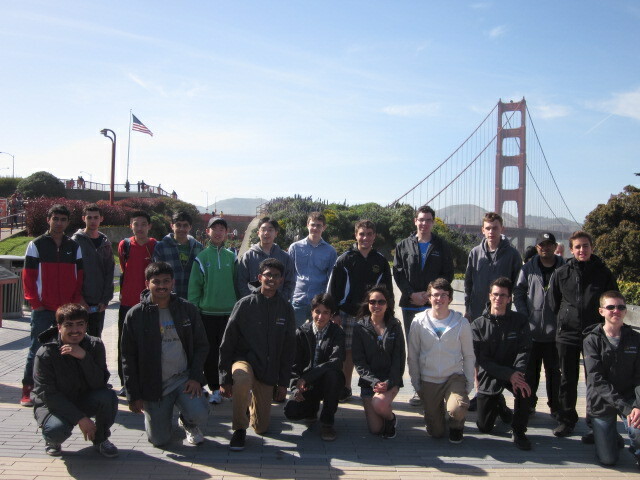 After a windy ride we stopped at the Golden Gate Bridge for everyone to tour the bridge on their own and take some classic San Francisco pictures. The final activity of the day was a definite favorite, a dinner yacht cruise on the San Francisco Bay. Within the first 15 minutes of boarding the boat the students had pulled chairs and sofas together on the upper deck where they had their own ‘inner circle’ going on. The yacht traveled under the Golden Gate Bridge, around Alcatraz and we even saw a couple of dolphins playing near the boat. The cruise was a great opportunity for everyone to visit and hang out on the deck with amazing views of San Francisco. Our final morning allowed everyone to sleep in a little bit and then walk through the breakfast line at the Google San Francisco office. The smiles really got big when the students received their final gift, a Nexus 4 phone with the charging orb. Before leaving Google the students had time to say their goodbyes and to relax and visit with each other after three nonstop days. We practically had to kick the students out of the room because they were all having so much fun designing a file transfer protocol together that took up 4 entire whiteboards! 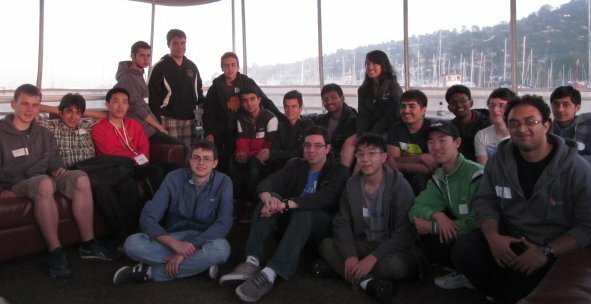 This was the largest group of Google Code-in winners that we have ever hosted. It was such a treat and privilege to chat with the students and to watch them engage with one another about ‘tricks of the engineering trade’ and make lasting friendships. For the majority of the students the Google Code-in contest was their first introduction to open source software development and now they are hooked! 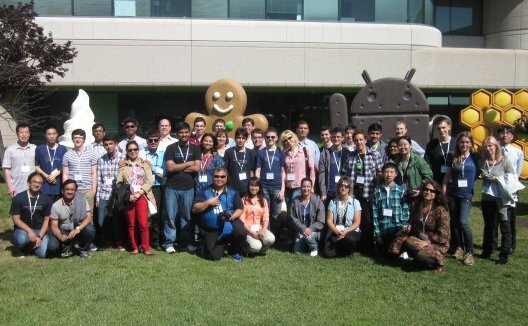 Congratulations to all 20 Grand Prize Winners and to all of the students who competed in the Google Code-in 2012 contest, we hope to continue to hear more great things from all of you in the years to come.